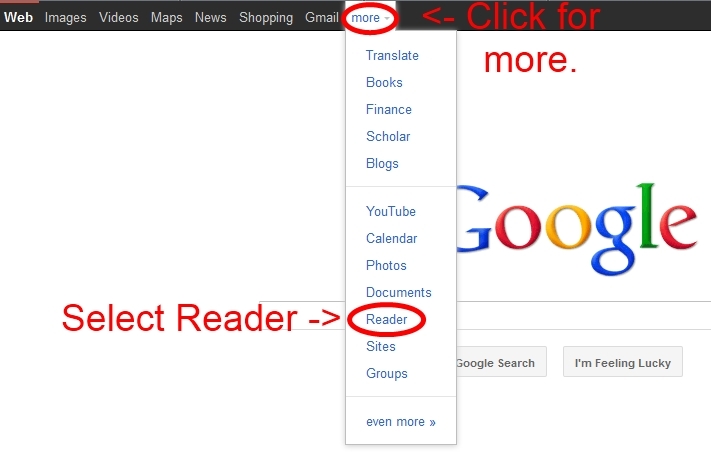 Another handy tool that Google offers is Google Reader. (Last month I posted on Google Alerts.) It simplifies keeping track of all the blogs you follow, or want to follow. 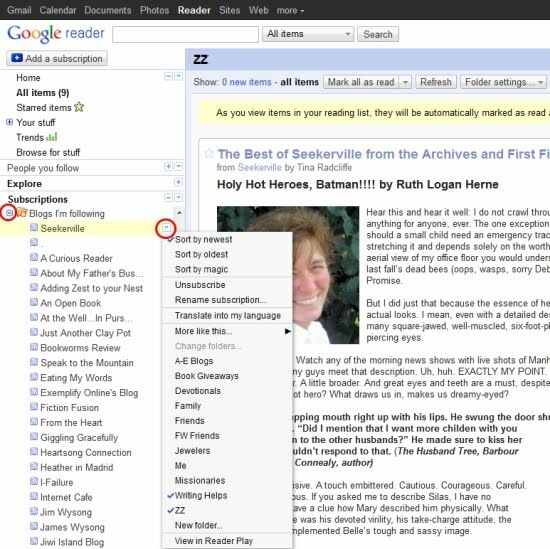 Google Reader offers you a place you can go to see all your favorite blogs in one place. Kind of like a one-stop shop. No, that's not it. More like a mall. All those stores (blogs) under one roof, letting you browse from one to another. No muss, no fuss. And they keep it up to date for you! In the large picture below, find the "All items (9)" on the left side of the picture. That tells me I have 9 new, unread blog posts in my reader. This is one of those tools that I love to use, but I don't use as much as I should. On the other hand, Joanne uses it faithfully, and if you know Joanne, you know how faithful she is when it comes to visiting blogs. Since it's such a useful time saver, let's work through how to use it. On the main Google page, click the drop down arrow for more. From the drop down list, select Reader. That will take you directly to your Google Reader. It's simply one of the services Google provides in the background, whether you use it or not. You'll see there are already blogs in there--Google put them there each time you clicked the Google Friend connect on a blog. 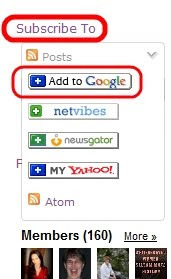 Following blogs adds them automatically to your Google Reader. Another way to add a blog to your feed reader is to subscribe to the blog. Many people have a Subscribe option somewhere. Click that and select the "Add to Google" option. If it makes a difference to you, this will allow you to follow a blog without joining the Friends of that site. Also, sometimes there isn't a Google friend widget, this gives you a way to add their feed to your reader, allowing you to keep up with their blog. Now, let's do something with your Google Reader (also known as a feed reader). 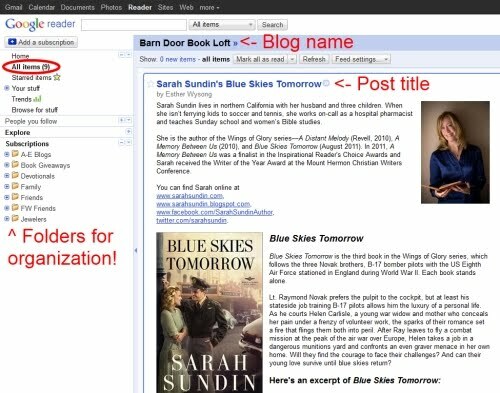 The really good news is that there's a way to organize the blogs in your reader. First, under "Subscriptions" there on the left side, click the plus or minus nubbin to the left of "Blogs I'm following". You want to see the list of blogs in your reader. Once that list is showing, click the arrow to the right of one of the blog names. Click the "New folder" option and type in the name for a folder. Click Okay and that blog will be put into that new folder. Make as many new folders as you'd like. If you change your mind about which folder you'd like a blog in, click the arrow for the drop down menu and check or uncheck the folders of your choice. Google Reader can streamline your blog reading and save you time. And because I'm celebrating, the blogging class I teach, Clearing the Blog Fog, is 25% off for October's class and there's a bonus tutorial I'm throwing in: How to Use Paint.net, which is the free photo manipulation tool I use to make headers, buttons and banners. Class is October 1 - 31 and it walks your through, step-by-step, setting up, maintaining and customizing your blog. So tell me, is it easier for you to follow blogs on Facebook than it is off of Facebook? You KNOW how much I love google reader :)I don't find Facebook a very helpful tool that way - but I'm in love with my current one, so I haven't really explored it as a reader in that way. Also, another way to add a subscriptions is right at google reader itself. If you click on "add a subscription" at the very top (above your list of blogs, you can just enter the url there and subscribe. I've been using google reader for a couple of years and love it! I also use google as my home page so can view the weather for my hometown as well as the cities where my children live. Another of my favorites is google bookmarks...really easy to use and houses my own list of favorites. 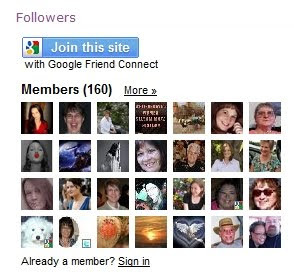 btw, I am in the top row of the google members below...I've never "seen" myself on another's page before...lol! I've been using the reader for a couple of years too and love that it does bring all my fav blogs under one roof. The drawback is that I don't actually go to those blogs as often and leave comments like I used too. I miss the fellowship blog hopping creates and I don't get to see all the beautiful page designs. So I intentionally try to click on the blog itself when I'm reading...like I did coming here today! Thank you for info. I'll definitely give it a try! I guess I have a lot to learn...:) Didn't know anything about google reader. As for following blogs, I don't typically follow them on face book, because when I'm on, it's only for a few minutes at a time. Couple Google Reader with Pinterest and you have a wonderful way to glean information and ideas quickly and simply. I didn't understand that "following" a blog meant they automatically went into my Google Reader. I use the method Joanne mentioned. So...thanks for information. I'll give it a try soon. I look forward to your blogging tips and tricks.